Here is a card that was featured on my old blog and was made using this beautiful Penny Black Chearful Stamp. I used this stamp to make a set of cards as a gift for my daughters teacher. The flower image was stamped with versamark ink onto sticky back canvas and then embossed with white embossing powder. I then used the alcohol inks and tool to add colour over the image. This was left to dry. When completely dry I drew in faux stitching with my white gel pen. I made the background paper using the Happy Definition stamp and the distress inks and curled the top corner. I used my Chipped Saphire ink to colour a small section of paper and stuck this under the curled corner for added interest. 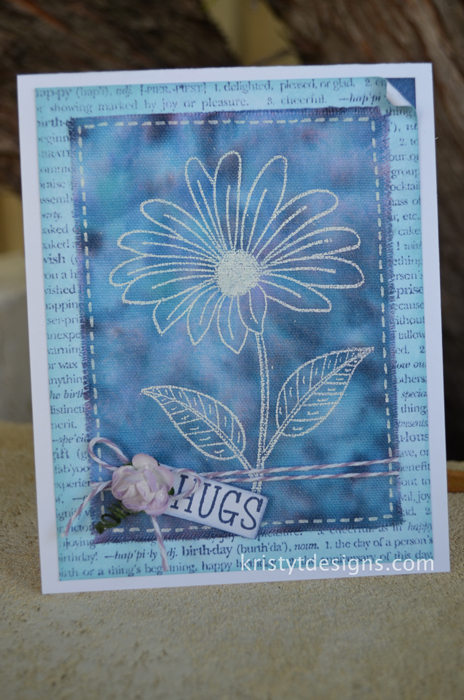 I tied twine around the image, curled the stem of the flower and made the small tag using the Hugs stamp. the card was then adhered together as shown in the photograph. This entry was posted in Alcohol Inks, Cards and tagged Alcohol Ink, Distress Ink, Hero Arts Stamps, Penny Black Stamps. Bookmark the permalink.